A view to Pittsburgh from a cliff area called “Mount Washington.” Our new apartment building is in amongst those tall buildings down there. It’s a cool place–a 1960s building on the historic register. Has a real “Mad Men” look to it. This entry was posted in Uncategorized and tagged Pittsburgh on October 9, 2014 by kittenupdates. The three of us drove to Pittsburgh in September for Caitlin’s six-month check-in and also to look for a place to live. We planned to stay there two full days: one day to find an apartment, the second day for the hospital appointments. I had narrowed all the potential apartment prospects down to two properties and I really hoped that one of them would suit us and have upcoming availability. A few days before we left, Nick and I were at a social event. A lovely woman we’ve come to know took me aside. “I hear you’re going to Pittsburgh.” Her uncle, she said, owned rental properties there, and her son worked for the uncle. He’d be happy to help us in our search. The son was a tremendous help, and the really cool thing? One of the uncle’s properties, and the one the son lived in, was one of the two I’d hoped would be perfect. And it was. An apartment is coming available there and we will be taking it. Probably moving down in December, once the chance of bad weather here could keep us from getting to Pittsburgh in the required 4 hours. The appointments went as well as they could. Caitlin really valued being there face-to-face, and used the time to discuss a lot of things that are difficult to discuss in detail via email and telephone messages. Unfortunately, as I’ve said before, the shortage of available organs means that people have to be sicker than they should be before transplantation. It is a double-edged sword. The national lung allocation scoring system, while better than it used to be, does not benefit CF or COPD patients as well as those with other lung ailments, since CF people can be very sick, lung-wise, but relatively ‘healthy’ in other respects. Caitlin still likely has a good wait ahead of her. 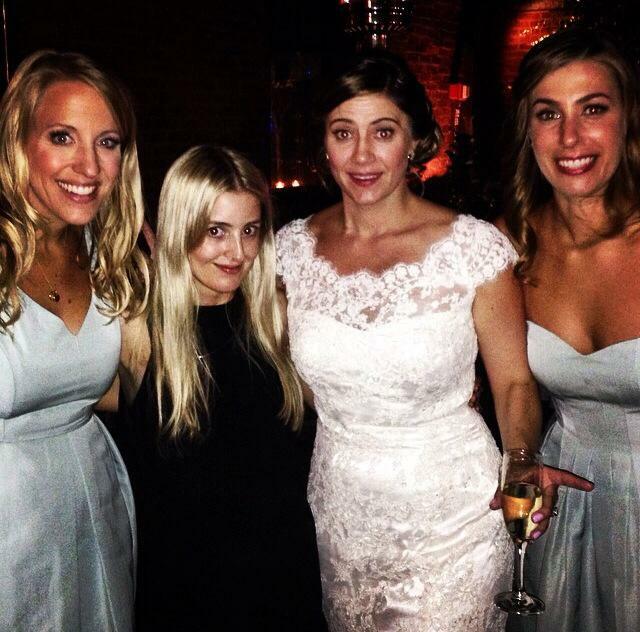 The great news was that she felt well enough to attend the wedding of one of her closest friends, Kenley, which took place in Providence on September 20th. Caitlin was the maid of honor. She didn’t walk down the aisle or participate in any of the maid-ly activities, but she did give a gorgeous speech that choked us all up. She took off her oxygen, momentarily, for the above photo, but that photo is a good example of how cystic fibrosis is such an “inside” disease. How can someone look so normal and be so sick? It took her a good week to recover from the wedding, but it was the best day of the year for her. Nick and I were thrilled to see her so happy, catching up with old school friends, the wonderful Andrew by her side. This entry was posted in cystic fibrosis on October 7, 2014 by kittenupdates.